There’s no doubt that the vast majority of customers I speak to about MailStore are using it for archiving Exchange in one of it’s many forms. 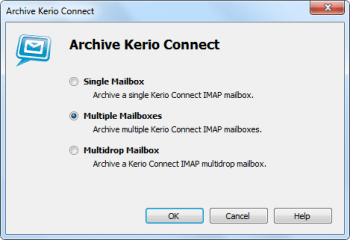 I’ve had a number of queries of late however, relating to the mechanics of MailStore’s new integration with one of the Exchange alternatives on the market, Kerio Connect (formerly Kerio Mail Server). I’ve found myself directing most people in the direction of the developer’s excellent online support pages so I thought it worth pulling out this article on the various setup options available to you as a Kerio Connect user.